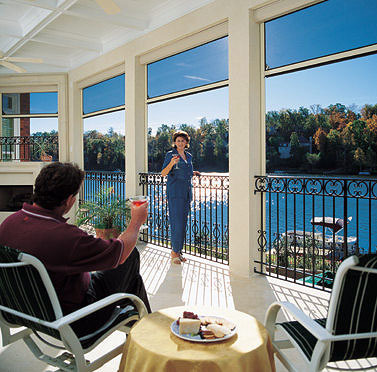 Our motorized insect screens are an ideal solution for closing in a patio area, sealing windows, doors and garage. Insect protection maybe just as important as sun protection and we feel we've got the answer zipped up. The Bay Screens Insect Screen does both - blocks the UV rays and seals out insects with an exclusive track system that literally zips you inside, safe and comfrotable on your patio and you can still see the sun set, because the screen doesn't block the view turning your home into an oasis. Insect: Reduces up to 55% of harmful UV rays, is recommended for large opening and is great for keeping insects out. Solar: Blocks the sun‚ heat and glare by up to 75% while keeping pesky insects out. Premium Solar: Offers substantial shading and reduces fading by blocking up to 80% of harmful UV rays. Privacy: A complete block-out material that provides up to 100% blockage of harmful UV rays.